Happy New Year!! Are there even people out there wanting to read this blog anymore? I have been a horrible blogger. Non-existent actually! 2009 started out strong with regular postings here and then our move from Okinawa to Virginia threw a huge wrench in that. I have not had the drive to blog since moving in the house and to be honest with you, the only thing that has kept me reading regularly has been my book club (thank you ladies) that I started here in the DC area in August. So, with that all said, I am not going to try to back track and analyze the books I read in 2009 or even acknowledge the many reading challenges I attempted, including my 34 of 34 personal challenge (read 34 books for my 34 years). I am going to start fresh and new and see where that takes me and you! How does that sound? 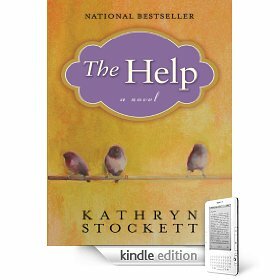 Right now I am reading The Help by Kathryn Stockett on my Kindle for book club and I just love it! The character development is rich and full of great detail. The story itself is riveting and keeps me guessing and on the edge of my seat. Book club meets on the 24th and I am now 70% done with the book. I am hoping to finish it by the weekend so I can get another book read before the next title is announced for book club. Last week I had hoped to get more reading done than I actually did while we were at Walt Disney World and on the Disney Cruise to celebrate my birthday but I am catching up this week since I’m sick from all the weather changes between freezing Orlando, warm Nassau and cold/rainy Castaway Cay (Disney’s very own island). I will only attempt to complete one reading challenge this year. That is the one I make for myself, which is to read a book for each year I’ve been alive. So in 2010 I will try to read 35 for 35! I have read your posts over the last couple of days and reading challenges are the hot topics among book bloggers now. What will you attempt to do this year or are you putting reading challenges to the side and just reading? I love the fresh year fresh slate idea! I love your blogging but understand when you move, things can get all rattled. I’m taking some steps back from challenges at them moment. I have too many books to read and want to read that don’t fit in a niche and I want to just enjoy. I’ve heard great things about The Help…looks like you picked a great read for the new year. Thanks for the kind words Amanda! A fresh slate is really just what I need with the blog. I was putting off blogging forever because the idea of catching up was so daunting. Then, this morning I just decided to start fresh and not worry about the fact that I hadn’t blogged in months. So here I am! BTW, I LOVE the pic on your blog of your snow bunny pup! Too cute! So nice to see you blogging again! Happy New Year and Happy Belated Birthday!!! welcome back! i was watching for updates and am happy to see you back on board for 2010. i’m sure the move was huge and the readjustment more so. i also read ‘the help’ and loved it. enjoy and i look forward to seeing you around the blogs again!! Welcome back! I was wondering what had become of you. You’re right to keep the pressure off – start clean. Looking forward to your thoughts on THE HELP. I’m one of the few people left who haven’t read it! Of COURSE we’re still reading your blog!! And I love our bookclub!! It’s so nice to always have that to look forward to each month! I love you gals and I can’t wait to see the amazing books we share and open each other’s eyes with in 2010!!!!!!!!!!! I’ve already started my challenge off strong, 4 books read and it feels amazing! Four down, 48 to go!! I’m totally motivated to read all the books in my “book closet”. Listening to audio books in traffic/while cleaning/while blow drying my hair/while folding laundry has been an amazing way for me to plow through some of the titles that have been on my list for years by multitasking. Loving the digital download capability on my library’s website for that. Bring it on 2010, you’ve got NOTHING on US!! I want to read!!! Please keep blogging! I may not read every book that is suggested and reviewed, but I certainly like hearing about my reading options!!! Also, I love your guest posts and your Sunday Salon!!! Every-so-often we need a break to take care of one’s self– keep up the good work! I’m still here!! I’d like to complete 50 books this year (I’ve always gotten close, but never to 50). I’ve also joined a few reading challenges but I am especially excited about the All About the Brontes challenge and will be starting Jane Eyre soon! Hey Steph!! Before I forget, your new kitchen/living area looks FANTASTIC! Everyone who is reading this, this lady, Stephanie of STEPHANIE’S WRITTEN WORD, is one of the two bloggers (Lisa of BOOKS ON THE BRAIN being the other one) who inspired me to start blogging about books in the first place back in 2007. Good luck in reaching your goal of 50 books in 2010. I think you’ll hit it!! Awww, you are so sweet! We really must meet someday (maybe the next time I’m in the DC area visiting my niece)! I saw your call for readers on Facebook just now – I’ll remind my books contributing editor at BlogHer about you. Hope you’re well.